Aqua culture mod is great diversity of marine fauna of your game. 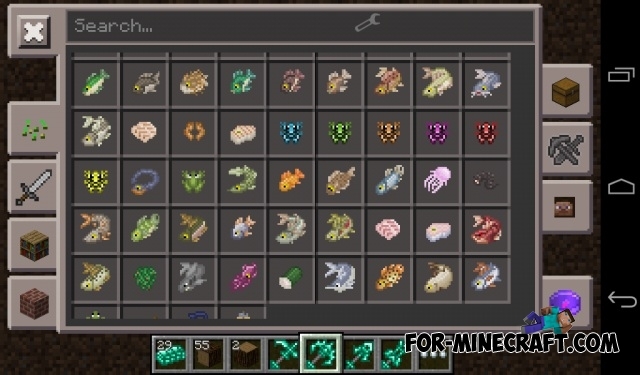 Now will be added more than 20 different types of fish and crabs, jellyfish and other inhabitants of the deep sea in your MCPE. In addition, you will have a new set of tools and a new ingot. Of course, you will not be able to find new types of fish in the water. This mod is created for a small variety of game. Aqua Creepers Mod for Minecraft Pocket Edition 0.10.5Aqua Creepers Mod - modification adds an unusual type of creeper. What do i do? I have a htm file what do i do with it?